If you were a leader of a group of Iron Age people looking to build a settlement in the centre of Skye, you would immediately have been struck by the advantages of the high ground that rises to the north of Bracadale. Commanding views over sea lochs to the north and west, and a strong defensive position from all angles made this an ideal choice for the siting of a broch. For archaeologists, brochs are some of the most baffling structures of ancient Britain; despite being scattered extensively throughout north and west Scotland, they are still defying attempts to explain their true purpose. What we do know is that their structure was designed to withstand some serious onslaughts, either from the elements or from unwelcome visitors. The walls at Dun Beag are 12 feet thick, with a characteristic gap in between them enclosing a stone-built stairway that would have spiralled around the entire building. This is taking cavity wall insulation to a whole new level! Either that, or the broch’s builders were expecting some very unpleasant callers. There would have been a central fire, and the smoke from this would have had to percolate out through the walls and the roof. We can only imagine the choking atmosphere inside. The Picts, early ancestors of Scotland’s people, are thought to be responsible for building brochs such as Dun Beag between about 100 BC and 100 AD. Their design, reminiscent of a cooling tower, is peculiar to Scotland. Brochs had no windows, and the roof may have been turfed or timbered. The broch at Dun Carloway on the Isle of Lewis is said to have had a large capstone roof. It is difficult to estimate the original height of Dun Beag because the place is in a ruined condition, but one theory suggests that brochs such as this one may have risen to over 40 feet. Today, the remaining walls are no higher than four or five feet, and it is possible to walk around on top of them. You can also stand in between the two thicknesses of wall, and peer into curious small chambers whose original purpose is now lost. Dun Beag is almost perfectly circular, and its interior measures about 36 feet in diameter. The stonework, even today, shows the skill of its builders. Archaeologists have speculated that the structure would have had several floors, the lowest one on a level just above the boulders that jut out of the centre of the natural outcrop. 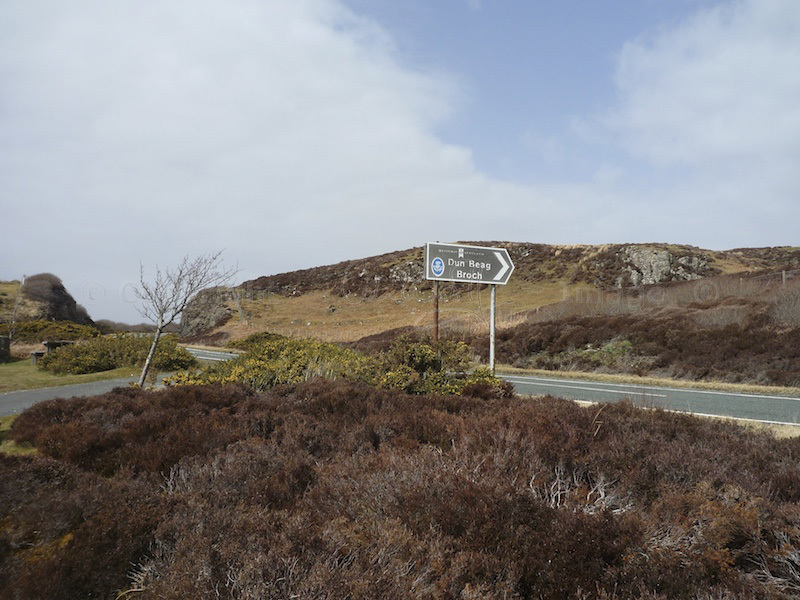 The RCAHMS database, Canmore, reveals an extensive list of artefacts discovered at Dun Beag. These include a gold ring, a glass armlet covered in coloured vitreous paste, and a pick carved from an antler. Cattle and sheep bones point to the remnants of meals, along with a ‘cake’ of carbonised seeds that were thought to be oats or rye. Our earliest picture of Dun Beag is slightly blurred, however, because of the strong probability of continued occupation until comparatively recent times. The evidence lies in archaeological finds as well as in the presence of ruined buildings – now visible purely as heaps of stones – all around the site. Norse inhabitants are suggested by the Scandinavian-style ornamentation on a bronze buckle that was found there; for the Picts, the appearance of Viking longboats in nearby Loch Harport would have been very bad news. Later residents dropped coins from the reign of James VI of Scotland and the English kings Henry II, Edward I, George II and George III. The RCAHMS also describes several hundred ‘globular glass beads… some plain and others in various shades of blue, amber, red, green and white.’ These were found in debris inside the broch, but are not thought to be prehistoric in origin. I’d still love to see them! When Colin and I visited Dun Beag last month, we did so in the teeth of an Atlantic gale. Standing on the top of the walls was an exhilarating and literally breathtaking experience. Looking across at the distant sea cliffs, with another hefty shower quickly approaching, I could imagine a Pictish family hurrying up to the entrance, looking forward to getting warm and dry. So, was Dun Beag originally a residence or a holy place? I’ve visited quite a few ancient sites in my time, and most of them – especially ruined abbeys and churches – hold a distinct but indefinable atmosphere. Dun Beag has nothing of this, except a very quiet, enduring feeling of security, and for this reason (which is a pretty poor one!) I am inclined to think that it was a dwelling rather than a place of worship. But the truth is that we’ll probably never know. Dun Beag is in the care of Historic Scotland, and it lies just north-west of Struan in the west of Skye. Look for the brown signpost on the main road between Sligachan and Dunvegan. Another broch, Dun Mor, lies slightly to the north, but this is less well preserved. There are at least 10 ruined brochs on Skye; you can find a full list at Scotland’s brochs. Wow! This is really fantastic Jo. I’m just trying to imagine how the people built this and what they did here. Thank you very much, Susan! It really makes me wonder about it too. They must have been hardy people, but what a life and what a place to live! Beautiful photos, Jo, and an interesting point about the atmosphere there suggesting that this broch wasn’t a holy place; I’m swayed by your argument. Walls 12ft thick as well – that’d keep out the worst of the winter weather, I would imagine. You can’t help wondering how they worked things out in those days, how they got the broch virtually circular and knew how to build a spiral staircase. It’s a beautiful piece of design and makes me question if any buildings put up today will still be around hundreds of years from now, never mind thousands. Thank you, Lorna. I agree – I would question whether some buildings of today would last a century, never mind a millennium. I’m sure the thick walls would have given a lot of protection – a great idea, in fact! But building it, as you say, must have required master masons. There’s so much we don’t know about that time and the people who lived then. Interesting how ancient places can have such different atmospheres. I’m sure you’re right about it being a dwelling. Yes, it is interesting, isn’t it? Many holy places seem to retain a sense of calm and purity, but Dun Beag had a more homely feeling, even though it’s in a pretty remote spot. Thanks for your comment! Hi Elin, I wouldn’t be so sure… we last went to that part of Skye in the early 1980s, and on this latest visit we were amazed at how much of it seemed unchanged!